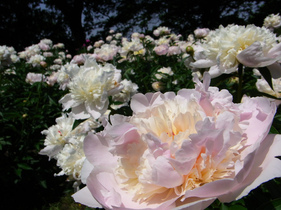 Paeonies have been cultivated from more than 2000 years as ornamental and medicinal plants. 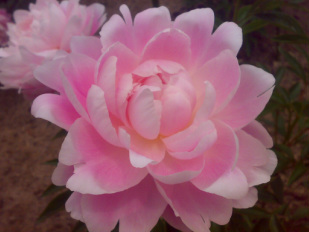 The size and voluptuous paeony flower is an alluring and captivating feature. In general, paeonies are long lived, hardy, relatively drought resistant, disease resistant and require low levels of maintenance. The name derives from the Greek word ‘Paeon’ – ‘a physician to the Gods’, and after curing Pluto of a wound, he was changed into a flower to protect him from the jealousy of the other gods. In the nineteenth century, tree paeonies (Paeonia suffruticosa), and the herbaceous paeonies (P. lactiflora) were introduced from China, adding to varieties found in Europe. New intersectional hybrids developed between herbaceous P. lactiflora hybrids and shrub P. suffruticosa are available. 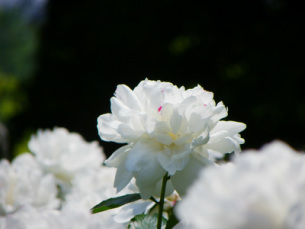 These are called Itoh hybrids, grown and bred with an aim of developing a double yellow paeony.